Make chat your next revenue channel with Chatkit, the only full-funnel Chat Marketing platform for ecommerce. 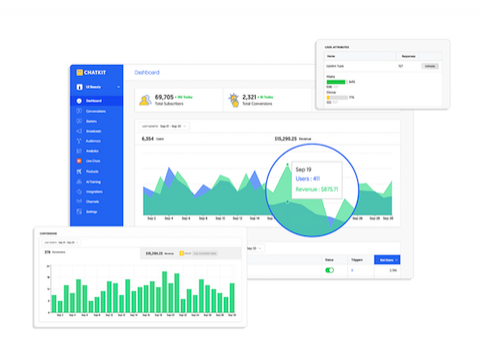 Our platform enables Merchants to discover (and recover) huge amounts of revenue at an ROI that exceeds digital advertising and email marketing campaigns. 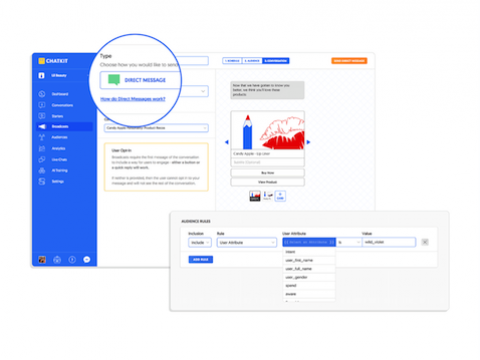 Chat-based retargeting enables you to provide tailored product recommendations, as well as recapture shopping cart abandoners with a single click. With no spam filters or ad blockers to impede delivery, chat provides brands with 3x the conversion rate of email and 10x the engagement rate of ads. That means people actually read your messages, and are far more likely to engage with your brand. Chat enables you to send hyper-tailored messages that keep your brand top of mind throughout the buyer journey and positively impact consumers’ buying decisions. That's why Chatkit is the best way to increase conversions and earn long-term customer loyalty. 1. Grow your audience with hyper-personalized experiences that mimic offline shopping interactions. 2. Seamlessly integrate your store, connecting your customers directly to Chatkit conversations. 3. 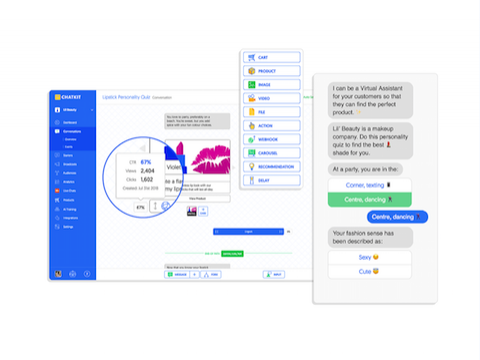 Design interactive, creative chat conversations in minutes—no coding required. 4. Provide 24/7 customer service and reduce your human-support costs. Our AI can be trained to automatically respond to common customer queries. 5. Place chat plugins on your website with the click of a button. 6. Send powerful abandoned cart and post-purchase messages. Chatkit’s advanced AI automatically messages people throughout their customer journey. 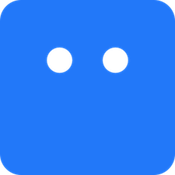 Your bot sends welcome messages, product recommendations, abandoned cart notifications, and much more at the appropriate time in a customer’s lifecycle. You can insert product recommendations into conversations with customers, who receive mobile push notifications when you message them. We provide a unique, full-service solution for our customers with as much or as little strategic support as you need. From dedicated training and onboarding through strategy and implementation, your success is our #1 goal. Need help? Contact us at [email protected].